The latest weekly United States Mint numismatic product sales report contains the opening figures for several recently released products. This includes the proof and uncirculated Edith Roosevelt First Spouse Gold Coins, the 2013 America the Beautiful Quarters Circulating Coin Set, and the Mount Rushmore Quarter Three Coin Set. 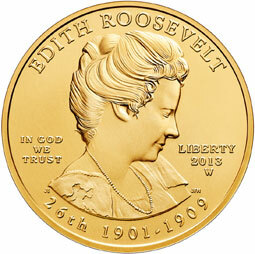 The US Mint began accepting orders for the Edith Roosevelt gold coins on November 21, 2013, which came only one week after the prior release of the series. The proof version was priced at $840, while the uncirculated version was priced at $820, based on an average gold price within the $1,250 to $1,299.99 range. Through the reporting date of November 24, sales have reached 1,089 proofs and 673 uncirculated coins, for a combined total of 1,762 out of the established maximum mintage of 10,000. Sales were markedly slower when compared to the prior release featuring Ida McKinley, which had opened at combined sales of 2,227 coins. The weaker opening may be attributable to precious metals prices. Since the price of gold dipped below the $1,250 level just before the start of sales, some collectors may be holding off their orders in hopes of a potential price decrease this week. The 2013 America the Beautiful Quarters Circulating Coin Set opened relatively strong at 10,681 units. This set contains circulating quality examples of each of the year’s five quarters from the Philadelphia and Denver Mint, at the low price point of $5.95 per set. The 2013 Mount Rushmore National Memorial Quarter Three Coin Set opened with sales of 9,971 units. This was somewhat stronger than the previous three coin set featuring the Fort McHenry Quarter, which had opened at 9,398. Also within this week’s report, the 2013-P Perry’s Victory Five Ounce Silver Uncirculated Coin has sold out with last reported sales of 17,721. This is the third design for this year to have sold out. Now only the final two designs featuring Fort McHenry and Mount Rushmore remain available for sale. Gracious me, and heavens to Betsy: what’s up with the early sellouts of the ATB hockey pucks? It’s not like they’ve reached maximum mintage, and there’s still a whole month left in 2013! Dudes, crank up the machines!